Man means all of mankind, all human beings. 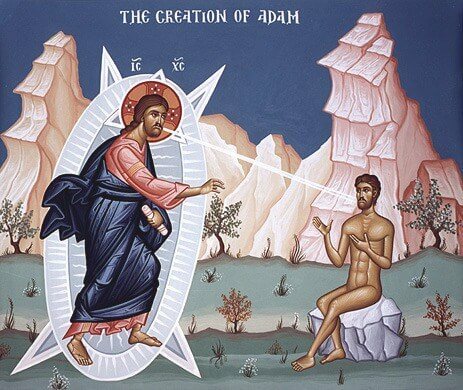 Orthodox Christianity has always held an exceptionally high view of mankind, that each one of us is regarded as a person (‘hypostasis’ in Greek) created in the image of God, an icon of the Creator. Man exists because of the love of God, and in order to receive the love of God. When God created human nature, He created it not only for us but also for Himself, since He knew that one day He would Himself become a human being. Thus, He fashioned something adequate to Himself, something possessing an infinite potential. St Gregory Nazianzen calls the human person a ‘created god’. As the Psalms and Jesus Christ says, “I say you are gods” (Psalm 81:6 LXX, John 10:34), each human person is meant to become god. Our potential as man is to be a god-man. The church Fathers, basing themselves on Scripture, teach that the soul and the body are not foreign elements united temporarily in the individual, but are joined together and for all time in the very act of creation: The soul is ‘betrothed’ to the body and is inseparable from it. Only the entirety of soul and body together comprises a complete person, a hypostasis. St. Gregory of Nyssa calls the unbreakable link between soul and body an ‘inclination of affection’, ‘commixture’, ‘community’, ‘attraction’ and ‘acquaintance’, which are preserved even after death. The soul of man, as the spiritual component, is of great value, so much so that Christ tells us, “What profit is there to a man if he gain the whole world and loseth his own soul, or what giveth a man in exchange for his soul?” (Mark, 8:36-37). And the body, too, has great worth, because the soul acts together with it. The body is the temple of the spirit that dwells therein. “Do you not know that the body is the temple of the Holy Spirit within you that you have from God?” (I Corinthians, 6:19) St. Paul asks. And the body, which is made of clay and is material, is destined not to be lost. It is sanctified by the Spirit of God that dwells within it. It receives the Body and Blood of Christ at the time of Holy Communion. With death it will return to the earth, but at the Second Coming of Christ and the Resurrection of all, it will be resurrected. Resurrected. Reunited with the soul. Incorruptible and immaterial, to live forever with the soul near God. The two, body and the soul, will comprise for eternity each man’s personal identity. 1) Submission to the whole church rule. 2) Submission to civil order, or to family duty, for they are conduits of God’s will. 3) Obedience to God’s will as manifested in your fate. 4) Obeying your conscience in the doing of good deeds. 5) Subjecting yourself to the spirit that is zealous to fulfill its vows. 1) Attending holy Church services. 2) Prayer, as specified by the Church; home prayer rule. 3) Using holy crosses, icons and other sacred substances and objects. 4) Observing holy customs established and promoted by the Church….